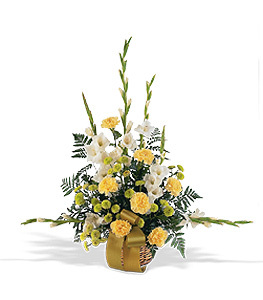 This traditional arrangement with its yellow, green and white will send your most comforting wishes to family and friends. One arrangement with white gladioli, yellow carnations, and chartreuse button chrysanthemums is delivered in a round wicker basket. Page loaded in 0.5189 seconds.